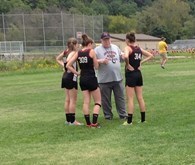 Coach Conley has been coaching Cross Country and Track since 1999. He holds two undergraduate degrees from Eastern Kentucky University, History and Political Science. He holds a Masters of Special Education from Ohio University and studied at the postgraduate level at Miami and Marshall. He is Bloom-Vernon’s Technology Coordinator, Director of Gifted Services and is the Quiz Bowl Advisor. He has been married for 26 years and has 4 children. He also won gold medals in the 1984 Olympics in Luge, Interpretive Gymnastics and Curling.